Just imagine you’ve waited for so long and saved enough money to travel abroad so you could enjoy your much needed vacation with your family. Had booked your flight, your itinerary is done and dusted, hotel accommodations booked as well as visa to your destination country, then on that very day of your trip, after check-in at the International Airport like everybody else you need to go through the Immigration window prior to your boarding. But unknowingly and to your surprise they won’t allow you to leave because you have similar name identical in the hold departure lists. This can happen not just for foreign visitors but for Filipino travelers leaving abroad. It can be another time consuming and possible hassles every time you travel for business since you will always end-up being screen and questioned at the immigration counter. But you can always prepare and avoid it. So what is a ‘Namesakes’? It is like having a twin brother or sister baptized with the same first and last name, however, your twin name has a criminal or having a derogatory records. 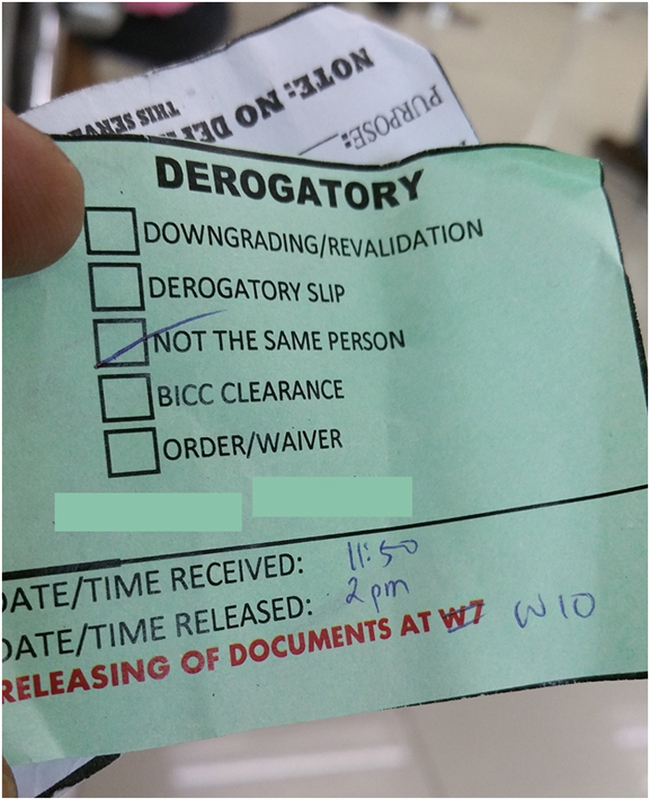 If you’re familiar with the word ‘hit’ when you secure your NBI Clearance it’s basically the same concept. 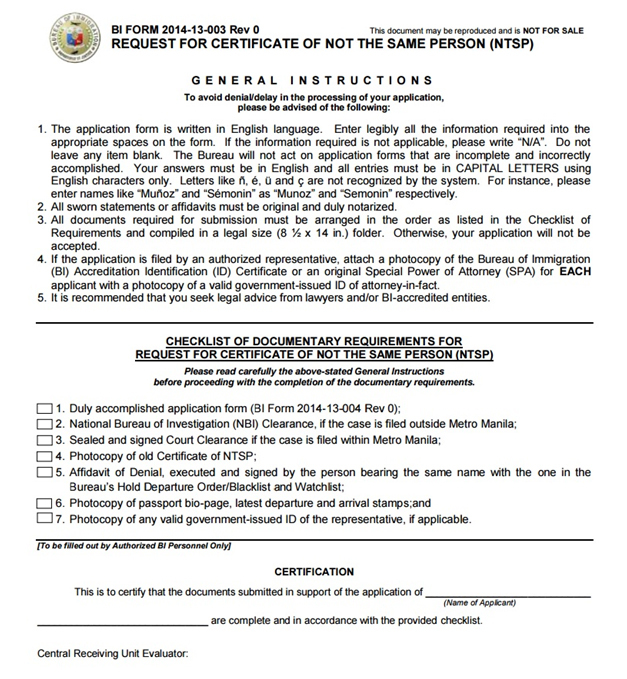 An affidavit must be executed to clear your own name. With the sharing of information among countries due to terrorism as well as for security purposes, the Immigration Bureau need to verify the status of one’s traveler personal information prior to departure as well at the time of arrival. They need to make sure that people traveling are clear. Meaning you don’t have pending cases or not in Bureau’s Hold Departure Order/Blacklist and Watch list. In other word’s you’re not a flight risk. Who need to get an NTSP? According to Bureau of Immigration ‘An individual attesting to the fact that he/she is not the person listed and/or included in the derogatory database or record’. I know few people who had similar experiences every time they travel, even they holding a foreign passport or migrated to another country but since they have a very common name they had to get clearances every time they travel back to the Philippines. It is becoming cumbersome especially if you’re travelling only for few business day. Non-the-less the Immigration Officer should make a prudent call to these isolated situations. Further, this issue didn’t passed the ire online, it has been debated and sensationalized by netizen when Overseas Filipino Workers (OFW) were also affected and could costs them time and money to go through this processes as well. An application form No. (BI Form 2014-13-004 Rev 0) can be downloaded via the Bureau of Immigration online and it’s free. An affidavit of denial, this must be notarized. Prepare to pay at least P300.00 and you can always get the services behind the Bureau of Immigration office, a heap of notary public is available. Make sure you scan and print copies of your passport, the main page which shows your personal information, your last departure and recent arrival to save costs. The entire process will take at least few hours but depends on the volume of applicants as well as the completeness of your documents it can last for a day. The express fee to get the Certificate is P500.00. 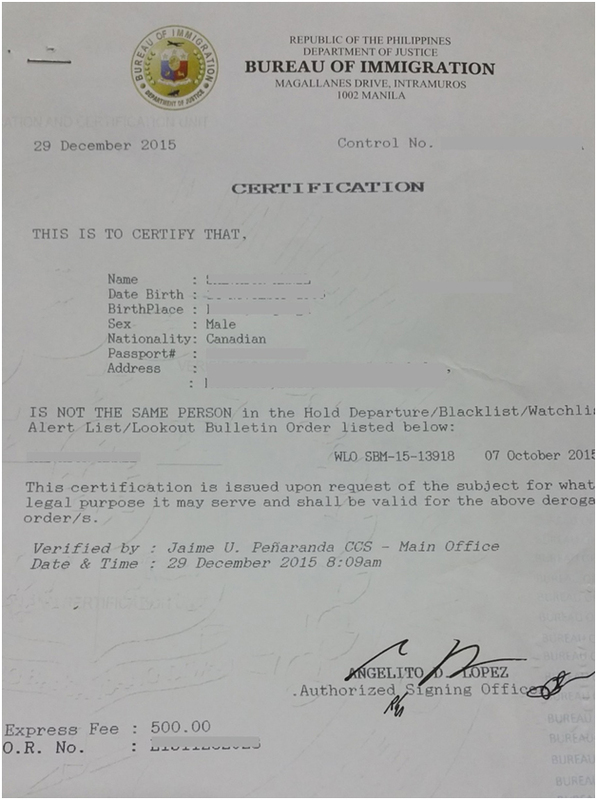 If you don’t have the luxury of time to wait for the release of your certificate, you can always send somebody else to get it for you but requires a copy of your representative ID. There is a need to further improve and have a better system that can served the public to avoid these inconveniences, the time spent commuting, waiting on queue that could have been enjoyed with their loved ones. Our government agencies should have a centralized databased for records than can be pulled out for cross-referencing. This will not only isolate similar names but other personal details or physical attributes like age, height, weight. With the evolution of technology biometrics is already in use for security reason by other countries these will better ID travelers. So the next word of advice when you choose a name to your kids think twice and just don’t pick-up random names of famous movie stars, chose something unique.